We constantly find ways to give our students the practical skills and time with equipment to develop key work-based methods. For our BSc (Hons) Forensic Science students DNA analysers are essential industry-standard equipment used by forensic scientists in helping build DNA profiles. Known as DNA fingerprinting, it has many crucial uses – piecing together body parts, identifying individuals involved in mass disasters, giving results in paternity tests and their main use which is providing evidence in criminal cases. The theory of DNA profiling is introduced in the first year of the undergraduate programme and is built on throughout the degree, becoming more intensive and in-depth as studies progress. In the third year students get a chance to use the DNA Analyser and build their own DNA profiles. The analyser works by taking an extract of body fluid and students take a cheek swab. 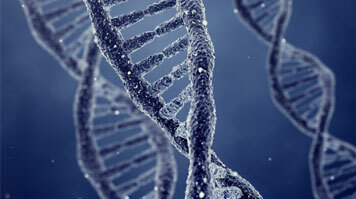 Then, in the first stage of the process students targetspecific regions of the DNA, called introns. Hannah Wilson, Director of Undergraduate Forensic Science, says "the sole responsibility of forensic science in the criminal justice system is to objectively process the evidence in order to bring criminals to justice, convict the guilty and acquit the innocent." This approach provides students with a solid grounding in theory of DNA profiling and an understanding and ability to use the equipment used every day by professional forensic scientists. Furthermore, they gain insight into the type of objective mind-set needed by forensic science and criminal service professionals. Each person's introns are unique – the profile that a forensic scientist looks for is based on a unique number and sequence of repeats within these sections, called Short Tandem Repeats. The number of repeats in the sequence is the bit that varies person to person. Once introns have been identified from the source sample a scientist will make copies of these regions to create a larger sample. The whole process takes one to two days from start to finish. It begins with the extraction, which takes around two hours. Then, the PCR Polymerase Chain Reaction (PCR) - the process of copying the DNA strands, takes four hours. From this, the sample is then fed into the DNA analyser which will separate out and profile the individual based on the number of repeats. Britain has taken the lead in the use of forensic science in prosecutions. This began in 1984, when Professor Sir Alec Jeffreys, the godfather of DNA fingerprinting and profiling, accidentally discovered it was possible to individualise people based on their junk DNA. Then, in 1996, the UK National Criminal Intelligence DNA Database was set up by the British government, the first of its kind in the world. It is used by law enforcement agencies to identify suspects of crimes. The database contains around 6,000,000 individual samples. It is populated by samples recovered from crime scenes and taken from police suspects and, in England and Wales, anyone arrested and detained at a police station. The National Policing Improvement Agency claims that 'between April 2009 and January 2010 the National DNA Database produced 174 matches to murder, 468 to rapes and 27,168 to other crime scenes.' In addition, they say that the "National DNA Database continues to provide police with the most effective tool for the prevention and detection of crime since the development of fingerprint analysis over 100 years ago. Since 1998, more than 300,000 crimes have been detected with the aid of the Database."